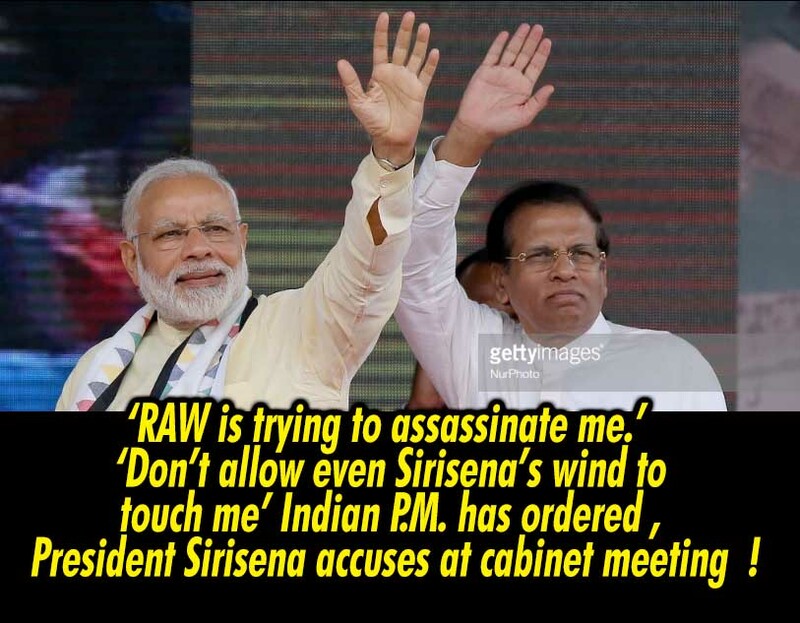 LEN - www.lankaenews.com | ''RAW is trying to assassinate me.’ ‘Don’t allow even Sirisena’s wind to touch me’ Indian P.M. has ordered '' - HE Sirisena accuses at cabinet meeting ! (Lanka e News - 17.Oct.2018, 11.50AM) President Pallewatte Gamarala at the cabinet meeting today (16) made a disclosure that shocked the entire cabinet of ministers. He said , the RAW (intelligence service) informants of India are engaged in activities to assassinate him. The usual cabinet meeting on Tuesdays chaired by the president commenced today ,and was concluded a little while ago. It is during this session the president startled everyone by making this baffling revelation. It is only a few weeks ago , the president who is by now best known for his demented and paranoid state alleged through a hired police informant of his who is receiving salary under him that there is a conspiracy to murder him. Though he tried his best to implicate the P.M. in that , because the IGP did not pay heed to it and treated as frivolous , the president began venting his venoms and vengeances against the IGP. The president suffering from a mental disequilibrium then concocted and spread a fairy tale that the IGP is going to resign. No matter what , the cabinet ministers had expressed their surprise and dismay over the incapacity of the president in spite of his most responsible position to understand the gravity of his wild accusation leveled against the intelligence service of a friendly neighboring country without any evidence . This is because even at the national security council meeting no such revelations were made by the state intelligence service , nor did any intelligence reports make such charges.